Borgo Panigale (Bologna), 26 November 2018 – The last chance to own a piece of motorcycling history. 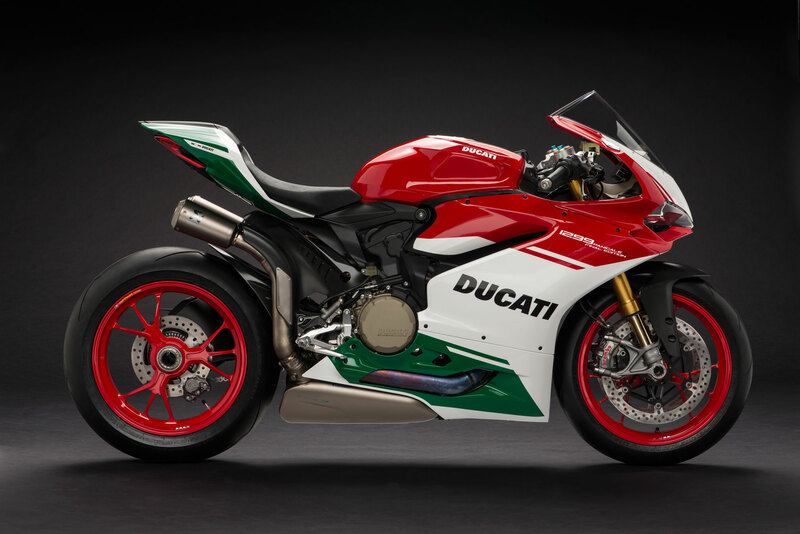 The very last exclusive 1299 Panigale R Final Editions are, in fact, now being delivered to #ducati Stores. The Final Edition is a truly special bike that pays homage to an engine that has made #ducati history and written some of the most thrilling chapters of the World Superbike Championship. That’s why only 1,299 such bikes (a limited, numbered edition) have been built. Every bike is delivered with a certificate of authenticity that makes this exclusive Superbike – a milestone among the Bologna-built twin-cylinders – even more valuable. This gem offers unparalleled technology, performance and design. Each #1299panigalerfinaledition is a Euro 4 compliant road bike. An offshoot of the 1299 Superleggera engine, the Final Edition Superquadro packs a 209 hp* punch at 11,000 rpm and a torque of 14.5 kgm at 9,000 rpm. It features a lighter crankshaft with a larger crank pin and tungsten balancing pads, while the con-rods, like the intake-exhaust valves, are made of titanium. As on Superbike engines, the two 116 mm diameter pistons have just two segments and slide on steel cylinder liners. Co-developed with #ducati Corse, the ultra-compact monocoque structure incorporates the airbox and plays a pivotal role in limiting the dry weight of the #1299panigalerfinaledition to just 179 kg. The chassis set-up features mechanical Öhlins suspension and a headstock rake of 24°. Equally sophisticated and light is the complete all-titanium Akrapovič exhaust with high dual silencer (Euro 4 compliant), exactly like the one on the Panigale R that has just ended its participation in the World Superbike championship. The electronics package features the Bosch Inertial Measurement Unit (IMU) and is equipped with ABS Cornering, #ducati Wheelie Control (DWC) EVO, #ducati Traction Control (DTC) EVO and Engine Brake Control (EBC). These systems have default settings linked to the selected Riding Mode (Race, Sport and Wet) but can be personalised as desired. Top-drawer tech content and the tricolour livery ensure the #1299panigalerfinaledition is set to gain cult status among the vast community of #ducati twin-cylinder aficionados. *The power/torque values indicated are measured using an engine dynamometer according to homologation regulation and they correspond to the homologated data, as quoted in the Bike Registration Document.